One of the standard academic criticisms of photojournalism is that it “aestheticizes” its subject. Catastrophes and suffering are not only documented but transformed into beautiful images, and any reaction to those images can’t avoid being compromised by the pleasure of viewing them. Instead of poverty and the political disaster behind it, we are shown an artistic portrait of a mother and child. Instead of the brutality of violence and the moral ugliness behind it, we are shown victims whose bodies are still beautiful. More generally, by continually framing the world for aesthetic appreciation–each image internally balanced, formally appealing, sensually evocative–photography remakes the world into a picture. That sense of the world provides continual reassurance that the reality being depicted is well-ordered and that whatever is wrong isn’t really, deeply, irrevocably wrong. In the same manner, the image world is one in which the spectator should remain just that–someone who only looks at what happens instead of trying to change it. 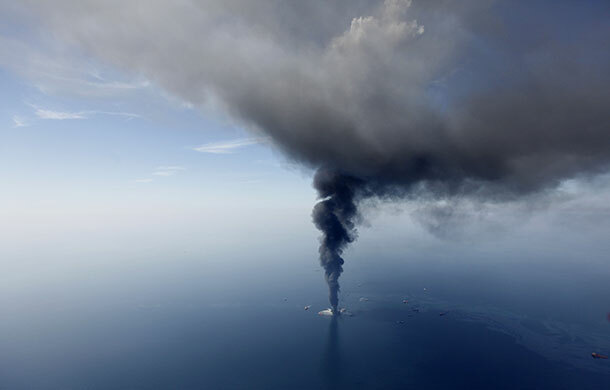 With that critical framework in mind, one would be expected to tear into this photograph of the Deepwater Horizon oil rig burning fifty miles offshore from Louisiana. The oil platform exploded last week and is continuing to pour 42,000 gallons of oil a day into the Gulf. Yet another environmental disaster that can be traced back to the US oil habit, the likely consequences and costs are all too apparent. As still more nonrenewable resources go up in smoke and pollute the seas it is easy to launch into denunciation of America’s addiction, capitalism’s amorality, and modernity’s hubris. That and more is needed to demand better engineering, regulation, and accountability as well as the technological, economic, and cultural development to get beyond the Age of Oil. Likewise, the image could be faulted for being part of the problem. It minimizes the spill: making it seem small, distant, a single pillar of smoke almost like a bonfire; worse yet, it looks like a natural disaster rather than one caused by a giant machine owned by a major corporation. And above all it makes the spill seem to be part of the beauty of nature. The smoke billows upward to become another cloud while sky and sea spread out serenely around it. Not to worry, it says: this small disruption is part of a much larger harmony, and in nature’s time all will be peaceful again, so all you need to is marvel at nature’s beauty. Even if that is how the image affects many people, I think it also can evoke a different way of seeing. Disaster coverage typically relies on dramatic images, and all photographers strive to get close to the action, but that intensified exposure can carry another illusion: the belief that the human being is naturally at the center of things, and not only in political matters but in regard to the behavior of the planet. I am not about to suggest that humans don’t increase global warming, but I am going to suggest that comprehensive change might come from stepping back rather than plunging into the inferno. Of the many images of the recent volcanic activity in Iceland, I found this one profoundly beautiful–and all the more politically valuable for that. Instead of the overheated accounts of the economic disaster befalling the airline industry, here the obviously explosive force of the volcano is both exposed and yet minimized, put back into wider and more expansive sense of scale. Because of the airline shutdown many small businesses were hurt, many lives were disrupted, and billions of Euros lost, and that should all get its due recognition, but it the midst of the economic drama it became easy to forget that we always live within nature. Not just when something blows, but always. And nature is very big. By letting this photograph work, the hubbub of coverage is replaced by a sense of awe–and not at the volcano, but at how a volcano can be a small thing. 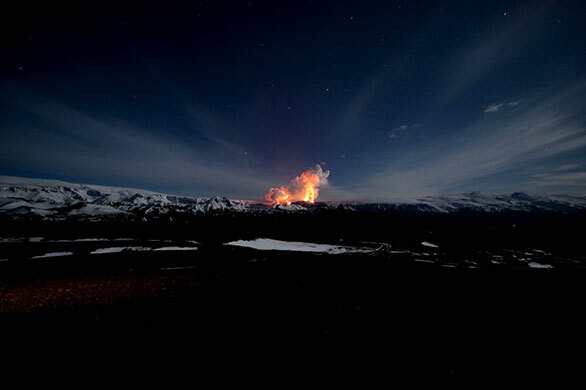 Although the eruption looks like a solar flare it also is a tiny part of one planet, which is a minute part of the cosmos. For all the problems caused by the ash, the economic event was a tempest in a teapot. For all the talk–including my own–about how humans are going to destroy the planet, humans are not going to destroy the planet. We pride ourselves perversely on being able to do so, and we are able to make a serious mess of things, but the planet will thrive long after we are gone. In fact, just as there is need to more beyond current energy sources, so is there need to change the way we see if we are to get there. The aesthetic appeal in these photographs is a resource for seeing anew. Their beauty offers a kind of humility: the acceptance of our smallness and our finitude. We should conserve and otherwise work toward more sustainable societies not because we can control nature and are so powerful that we can change the climate, but because we are such a small part of the universe and here for only a sliver of time. The beauty in the photographic image can distract and displace, but it also can be a source of wisdom. This explosion, that eruption: each is a small part of a much larger harmony, and in nature’s time all will be peaceful again. For precisely that reason, human beings should strive to preserve the earth that will outlast them, and to create societies that can work in concert with nature rather than in the pursuit of dominion. To that end, beauty is a form of moral truth. Photographs by Gerald Herbert/Associated Press, Halldor Kolbeins/AFP-Getty Images, and Lucas Jackson/Reuters. 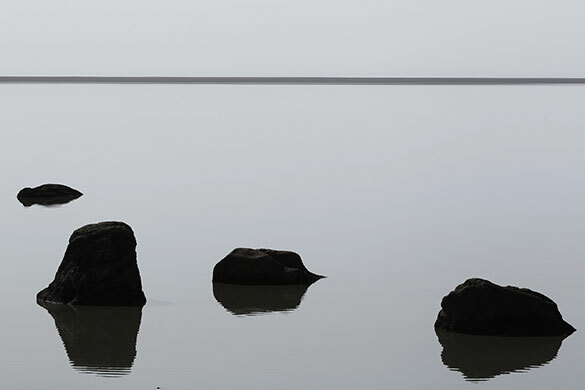 The third photograph is of rocks reflected in a lake that has been muddied by volcanic ash from the Eyjafjallajokull volcano. ← Previous PostSight Gag: Tea, Anyone?